Headlight Harness is a small, family owned and operated business run out of New Jersey. 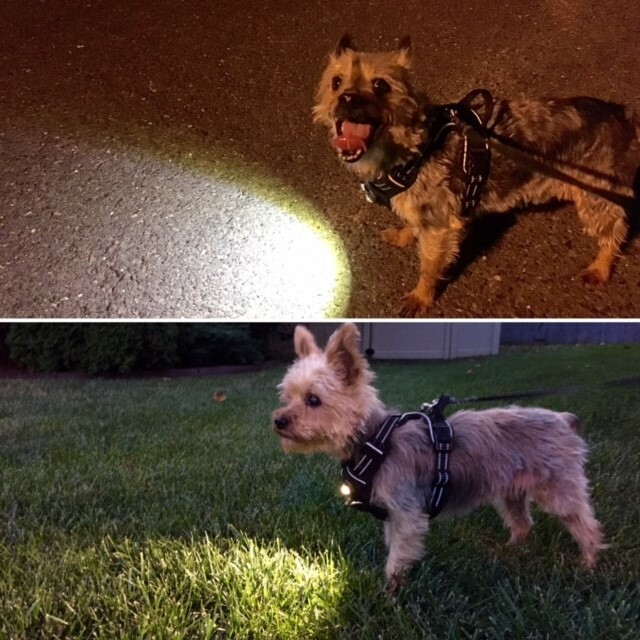 Formed in 2015 by Peter and Marilyn Pianelli, Headlight Harness and its products have already helped thousands of pet owners across the country keep their furry family members safe. The Headlight Harness family continues to grow by the day. Don’t be left in the dark. Join the Headlight Harness family today!!! The Headlight Harness, a solution to numerous problems. While out walking my dogs late one night in the summer of 2014, one of my dogs, a black Terrier named Mo, managed to wiggle free from his harness and run into the street. He was almost struck by a car that never saw him or even slowed down. Thankfully, Mo wasn’t hit by that car, but many dogs and their owners aren’t that lucky. It’s a scenario that plays out all too often across the country. Pets and their owners being struck by vehicles due to low light conditions and poor visibility. I decided there and then that my dogs and I would NOT be one of those statistics. I spent the next few months shopping for something that would keep my dogs visible to vehicles, safe on walks, and help me see my surroundings. Unfortunately, that product didn’t exist. So my husband and I spent the next year designing, developing, and producing the Headlight Harness. Originally intended for our own personal use, it quickly became apparent that our Harnesses filled a giant void in the pet industry. On every walk, I would be stopped by people and asked where they could get a Headlight Harness of their own, until finally, Headlight Harness LLC was born. At Headlight Harness, we have a simple goal: To keep you and your pet as safe as possible anywhere your adventure may take you. All of our products, from the Revolutionary, Patent-Pending Headlight Harness, to our Reflective Leashes and Collars, have all be designed around that core concept. We focus on Safety, Quality, and Comfort, and our products reflect those values. Our Harnesses are “No Choke/No Pull”, Highly Reflective, Light Weight, and include our patented, focused beam LED in the chest. The LED lights up the path ahead, helping you see in dark areas, and making you and your pet highly visible to any vehicles in the area which greatly reduces the risk of being struck. Our Headlight Harnesses are also compatible with any car or truck, and will keep your pet seated and secure during the ride, greatly reducing the risk of injury. Thousands of highly satisfied pets and owners have joined the Headlight Harness family, and trust us to keep their pets safe and secure no matter what their walk, car ride, or adventure may hold. Stay Seen. Stay Visible. Stay Safe.